The woman admitted punching the baby on three occasions. A WOMAN BEAT a 13-month-old girl under her care to death on a rural Montana Indian reservation, threw the baby’s body into a bin and reported her missing before confessing to the crime a day later, a federal investigator has testified. Janelle Red Dog, 42, admitted striking the baby on three occasions, but it’s uncertain if that’s what killed her, her lawyer said. Red Dog got scared after Kenzley Olson died, so she disposed of the body in a trash container several blocks from her house in the town of Poplar, attorney Mary Zemyan said. She later reported the girl missing. Red Dog appeared in tribal court yesterday on the Fort Peck Reservation, about 20 miles from the US-Canada border, and was ordered back into custody without bond, court officials said. Tribal prosecutors are expected to charge her by Tuesday, when she is scheduled for another hearing. It was the second major event in recent weeks to rattle the sparsely populated reservation, home to the Assiniboine and Sioux tribes. In late February, a man allegedly abducted and sexually assaulted a four-year-old girl from a park in the reservation town of Wolf Point. The girl was found alive several days later. 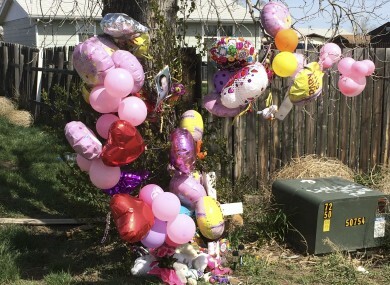 Fort Peck Tribal Chairman Floyd Azure said Kenzley’s death and the recent kidnapping stemmed from a rising drug epidemic that the reservation must address. Investigators haven’t publicly linked either case to drugs, but Azure told The Associated Press the use of methamphetamine was at the root of both crimes. Bureau of Indian Affairs investigator Ken Trottier testified in tribal court that Red Dog confessed to punching Kenzley several times on Tuesday, killing her, KTMF-TV reported. She then put the girl’s body in a duffel bag and threw her in a dumpster, he said. When Red Dog reported Kenzley missing hours later, authorities issued an alert that said the girl was kidnapped, possibly by a man and woman from North Dakota. The pair turned out to not be involved, and the alert was cancelled after Red Dog reportedly confessed and drew a map to Kenzley’s body. Prosecutors filed an affidavit outlining the allegations Thursday, but the chief judge overseeing the case has not released it. Zemyan said Kenzley had been under Red Dog’s care since the girl’s mother dropped her off about two weeks ago and then failed to return. Many details on the events leading up to Kenzley’s death remain uncertain, she said. “The only clear facts are that the baby was found in the dumpster, and Janelle told them where to find her, and that Janelle at some point struck the child. Those things don’t add up to murder,” Zemyan said. Azure said Kenzley’s mother was in jail when her daughter was killed. That was confirmed by the tribal jail, although the charges against her were not available. Attempts by The Associated Press to reach the mother and other members of the girl’s family were unsuccessful. Funeral services are scheduled for tomorrow. Email “Montana woman killed baby girl and hid her body in a bin”. Feedback on “Montana woman killed baby girl and hid her body in a bin”.